The Kansas City Royals run this postseason—six straight wins—has been nothing short of remarkable. In fact, just making the playoffs after 29 years of continually falling short of the Fall Classic was an achievement in and of itself. 1. The surprise is gone. Now that the whole country has gone from thinking they’re a great story to predicting them to sweep their second straight series, the element of surprise is no longer there. Generally when teams play Kansas City, they think of the 90-100 loss teams over the last 15 years as opposed to a team like the Yankees, which year in and year out puts some combination of fear and respect into every opponent that visits Yankee Stadium—regardless of how well they’re playing. Coming back from a 7–3 deficit to beat Oakland in the Wild Card, sweeping the L.A. Angels in the ALDS, and then winning the first two ALCS games on the road has put the Royals into the very bright spotlight of baseball’s postseason. They now have Baltimore’s attention. 2. Their running game was grounded in Baltimore. This may be the most important reason here. The Royals led the league in steals with 153. Of course, given that they were last in home runs, they have to steal to manufacture runs. But so far against Baltimore they’ve been grounded. In two games against the Orioles, they’ve been caught twice (both were Jarrod Dyson) in three attempts. Baltimore manager Buck Showalter had a plan to make the speedy Dyson, who stole 36 bases in a part-time role this year, feel uneasy at first by putting first baseman Steve Pearce off the bag a few feet, instead of standing on it. Pearce would then race back to the bag whether a pickoff throw was coming or not, and he was usually in the base path, causing Dyson to go around him to beat the throw back. It was a clever ploy by Showalter that gave Dyson something additional to think about and kept him from getting his usual great jump. If the Royals continue to be slowed down, they’ll have trouble scoring when the home runs disappear. 3. Mike Moustakas is not this good of a hitter. 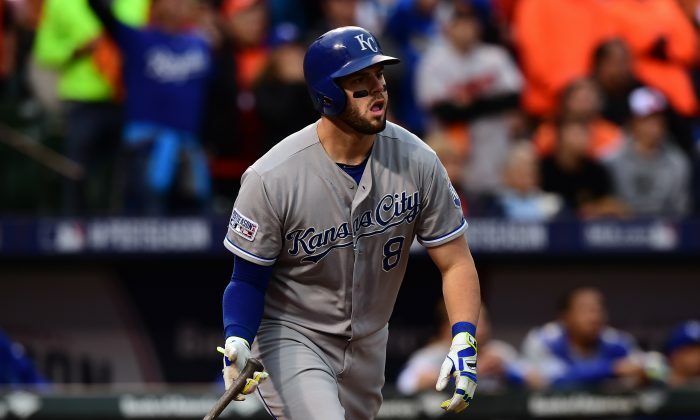 Royals third baseman Mike Moustakas has been off the charts in these playoffs, hitting .318 with four home runs in just six postseason games—good for a slugging percentage of .864. This from a guy who hit .212 in the regular season with 15 home runs in 140 games. This isn’t to say he doesn’t have talent. Moustakas was the second overall pick in the 2007 draft and tore up the minor leagues for a couple of years before being called up in 2011. At the major league level, though, he’s just a career .236 hitter. It seems likely he’ll come back to earth soon. 4. “Big Game” James Shields has been anything but. The Royals traded a major piece of their future, in outfielder Wil Myers, in order to get a top starter in James Shields from Tampa Bay a little less than two years ago. Shields has been great in two regular seasons going a combined 27–17 with a 3.18 ERA and logging more than 225 innings both seasons. In these playoffs, though, it’s been a different story. The Royals staff leader has a 5.63 ERA in his three starts and has yet to give them more than six innings in an outing. They’ll need more from him going further.